Many animal species feed on wild blackberries. Birds and mammals eat the dupes and spread the seeds. Wild blackberry flowers are pollinated primarily by bumblebees and honey bees. "Wild blackberry plants can live for 25 years or more. They produce vines that arise from a central crown or from buds that form along rhizomes (horizontal, underground shoots). First-year canes do not produce flowers. In the second year, the canes fruit and die. Tips of first-year canes that contact the ground form roots at the nodes, contributing to the lateral expansion of the plant." 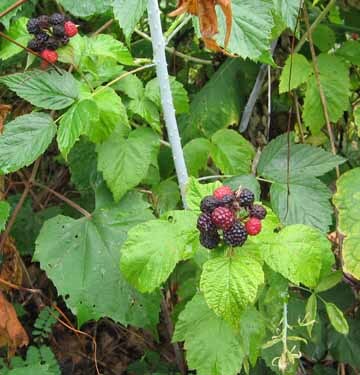 Wild Blackberries - Pests in Landscapes and Gardens. 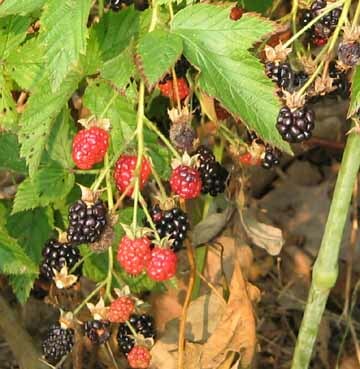 Because of their persistence and prickly manner, blackberries are considered noxious weeds by some gardeners. I have found them to be highly useful when I wanted to create a natural barrier against ner-do-wells who were damaging or stealing parts of my yard displays. Plus we enjoyed the delicious fruits in the summer!